Cameron Harper was involved with the first-team last season. 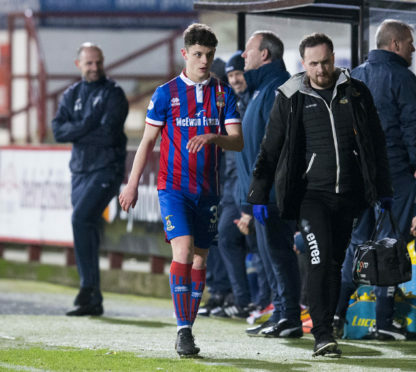 Caley Thistle manager John Robertson says he will not hesitate in handing teenager Cameron Harper his first team opportunity at left back in the coming weeks. Inverness have been left with a shortage of players in the position, due to the club’s dismissal of Riccardo Calder following a guilty verdict for attacking a woman, with skipper Carl Tremarco also sidelined with a thigh problem. Although midfielder Chalmers filled in at left back in Saturday’s 1-0 victory over Partick Thistle, Robertson has been excited by the progress made by 17-year-old Harper, comparing his style of play to that of Celtic and Scotland full back Kieran Tierney. Robertson has hinted a breakthrough for Harper, whose only senior appearance so far came in a 1-0 defeat to Dunfermline in March, could be forthcoming. Robertson said: “Obviously due to circumstances last week, and the injury to Carl Tremarco, we just felt going to Thistle we needed somebody with a bit of experience. “We have got a young kid, Cameron Harper, who is a really good player – he’s like a young Kieran Tierney. Robertson was thrilled with the way Chalmers stepped in to fill the void against the Jags, praising the overall performance of his Inverness backline. Robertson added: “Joe probably had his best game for the club the previous week against Ross County in the centre of the park along with Sean Welsh – the two of them were magnificent. “People were maybe panicking when we were left without a left back but Joe played there for Celtic on two or three occasions, and 24 times for Motherwell. “He can play there – it’s not a problem. He showed that, he was cool and calm and defended well. He got forward when he needed to and I thought him and Brad Mckay did really well.